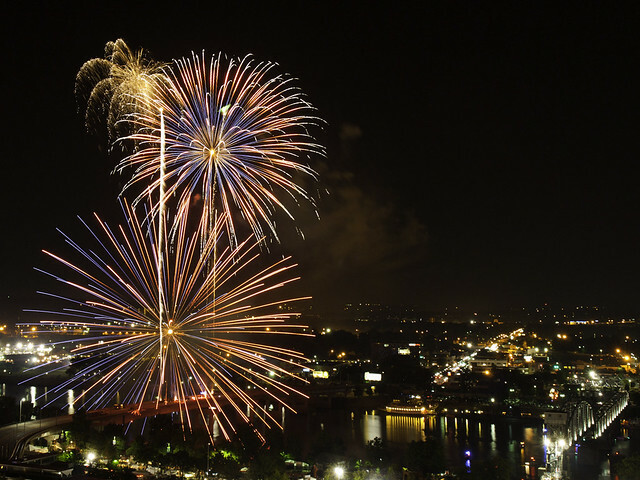 This past weekend was Riverfest, the huge festival in Little Rock's Riverfront Park. I didn't make it to any of the concerts this year (I would have liked to have seen Third Eye Blind), but did make it out for the fireworks show on Sunday night. 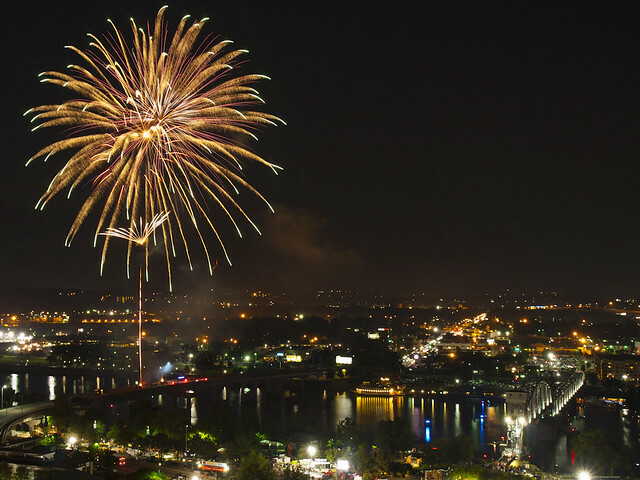 This year, we managed to get access to the top of the River Market Tower. So we got to enjoy the show from 20 stories above the hustle and bustle of the crowds. After securing a good spot on the rooftop, we waited for it to get dark. The view from up there was great, providing some good views of downtown. 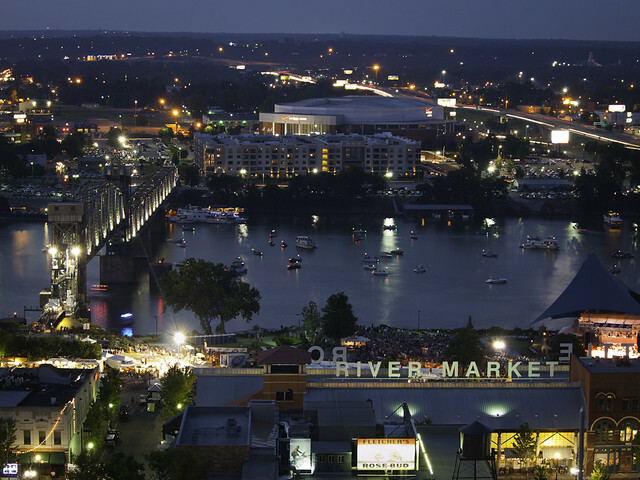 This is looking north, with the River Market, the amphitheater (where some country band was playing), the Junction Bridge, the Arkansas River and Verizon Arena. 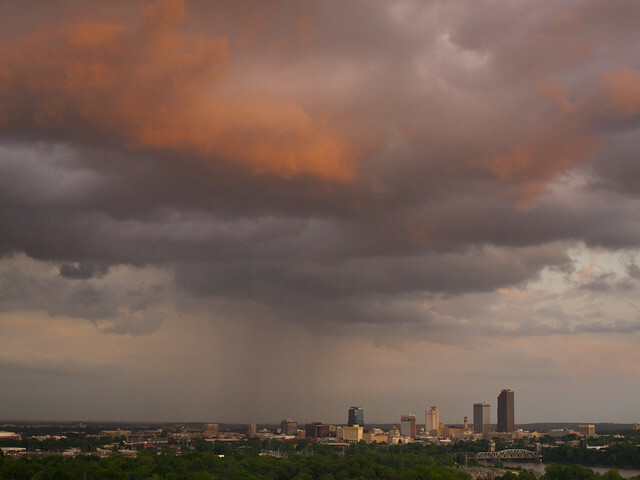 Here is the view looking west, where the last bit of the sunset was disappearing behind the Little Rock skyline. From Judsonia, I drove north on Hwy. 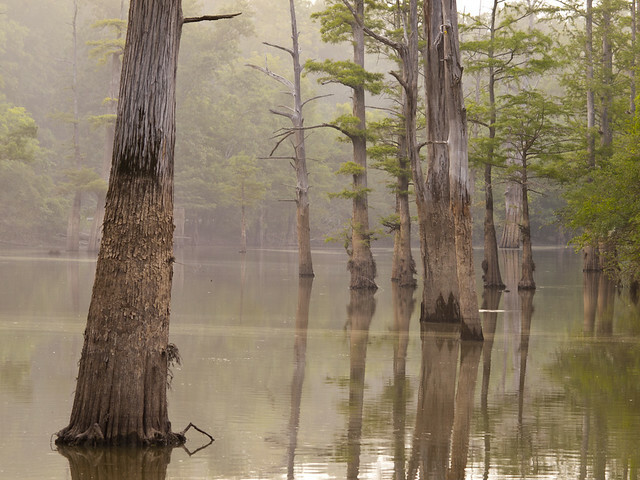 67/167 to the delightfully-named town of Bald Knob, and then headed east towards the Hurricane Lake Wildlife Management Area, which is run by the Arkansas Game and Fish Commission. 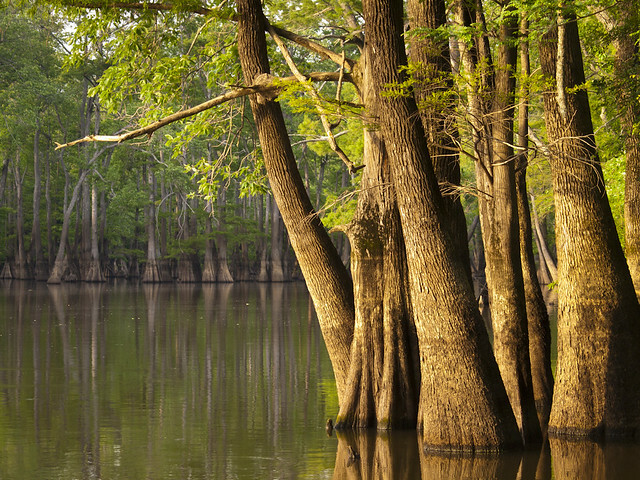 The WMA contains over 17,000 acres, and was originally set aside in 1941 as a game preserve. 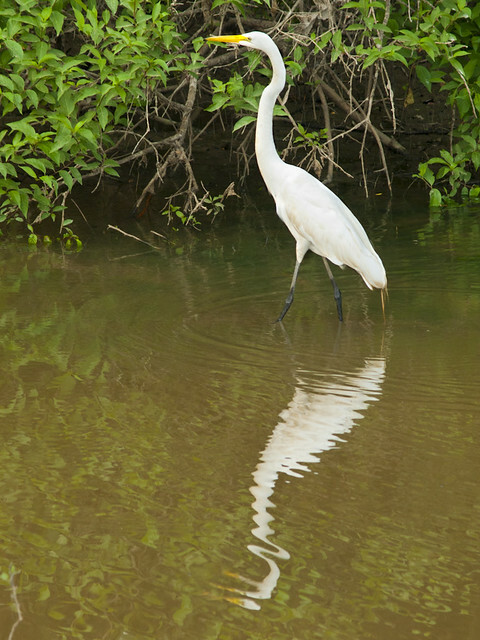 The area became a Wildlife Management Area in 1958, which preserves the bottomlands habitat and the birds and deer that live there. There is a lot of hunting and fishing at Hurricane Lake, but there is also some pretty neat scenery too. 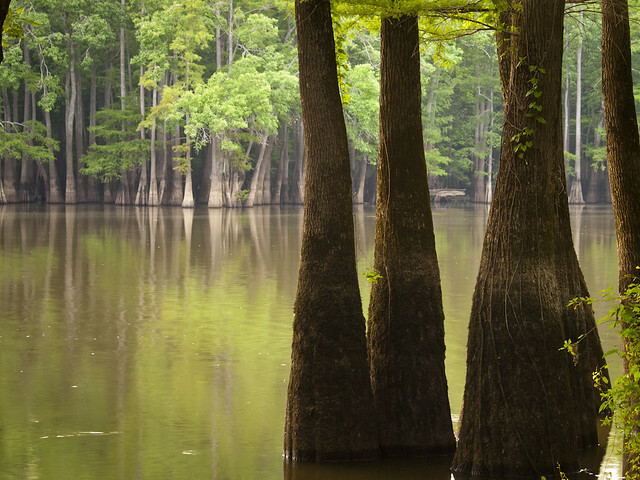 The WMA preserves much of Glaise Creek, several lakes, and woods that run up against the White River. 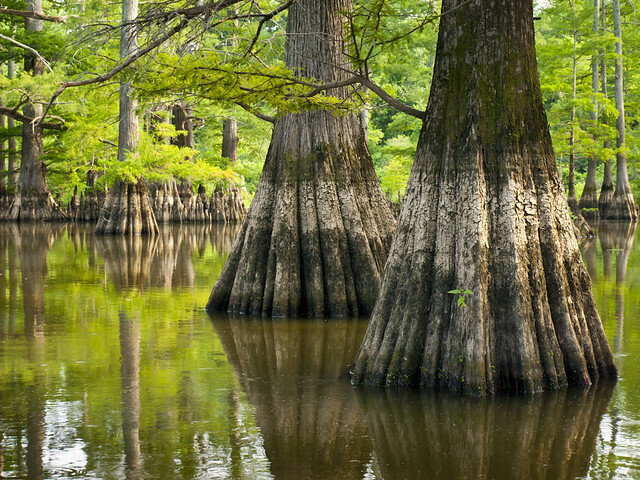 A lot of the water here is dotted by tall cypress and tupelo trees. It looked like a neat place to explore. I drove into the WMA in the late afternoon, and the light was still a bit harsh for pictures. So I took my time and lazily drove down the gravel roads, trying to scout out a few locations. I quickly found a few spots that I wanted to visit later on when the light was better. One of those spots was Bollie Pond. 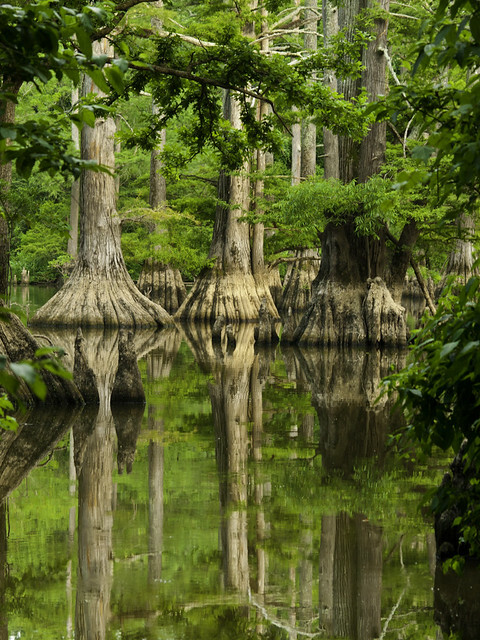 I looked at this pond earlier on Google Maps and was thrilled to see a small pond that was dotted with hundreds of cypress trees. I drove down the dirt road to the pond, and parked by a small campground. 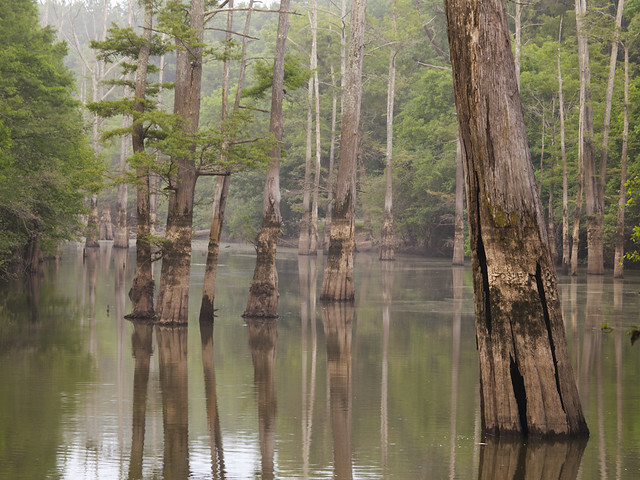 The pond was indeed full of cypress trees, but I couldn't really figure out a good place to take any pictures. The banks of the pond were covered with tall and thick plants, which were nearly as formidable as a castle wall. The only decent spot to get a picture was through a narrow gap where a boat launch had been carved out of the brush. I tried to pick my way through the shoreline, hoping to find a decent spot where I could point the camera. I didn't get very far when my mind began to drift away, thinking about all the numerous snakes that were surely slithering somewhere nearby. Cottonmouths, water moccasins, and king cobras (I assumed) were rushing through the swampy waters towards me. Not seeing any clearing in the brush, I hastily retreated back to my car. Just then, a boat came drifting through the trees onto the boat launch. A couple, who were camping there, had been out fishing. I asked if they had caught anything (one catfish). They asked if I was taking pictures, and so I told them I had been trying to find a good clearing to get a shot of the lake. Then, amazingly, they said that if I wanted good pictures, they would be more than happy to take me out on the lake in their boat. Was I interested? We got back to dry ground and I tried to get a few shots through the narrow gap in the trees at the boat launch. Even if there wasn't much room there, the view was still pretty nice. After that, I got back in the car and drove down the dusty gravel road towards Glaise Creek and the numerous lakes in the WMA. Along the way, I drove by two small lakes that sat on opposite sides of the road. In both lakes, there were dozens of cranes perched in the water. I slowed to a stop and tried to discreetly roll down the windows. Cranes are very skittish, and will immediately fly away whenever a human gets nearby (or at least tries to take their picture). But the cranes here at Hurricane Lake were much calmer, at least they waited a few minutes before they flew away. But it was enough time to get a few pictures. From there I drove over to Big Bell Lake, which was busy with people fishing and camping. I was surprised to see so many people out there, until I remembered that it was Memorial Day weekend. There were a few boats out on the water, and a few people sitting in chairs on the shore with fishing lines running into the lake. I set up the tripod and got a few pictures as the evening light cast a golden glow on the trees in the lake. Dusk was starting to settle in, so I drove on to try to get a few shots along the creek before it got dark. I got stuck in a convoy of other cars and trucks, heading home for the day. The traffic on the dirt road kicked up a massive cloud of dust, that lingered like a fog. I eventually just pulled over because I could barely see the road. The dust had turned everything grey, as if I was driving through a thick gelatinous void. 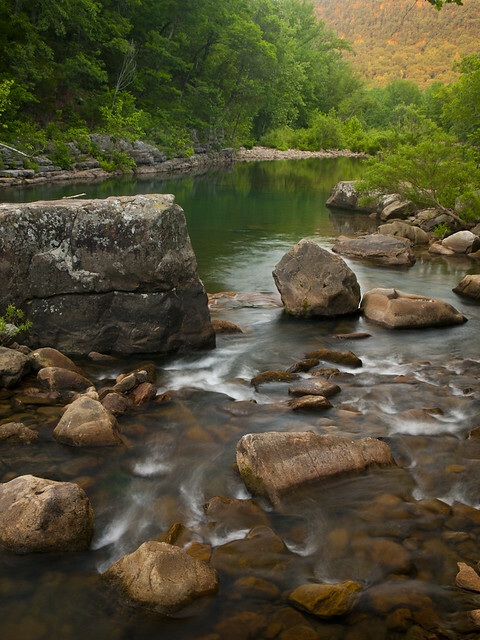 And one last shot of the creek. What looks like fog here is actually lingering dust that was sent up by the traffic on the gravel road. On Saturday I decided to head out and take a few pictures. 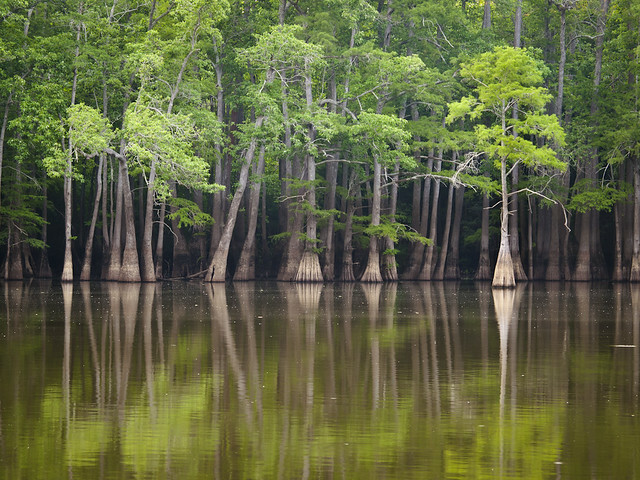 I drove north from Little Rock, heading towards a swampy area that looked like it might be photogenic. But along the way, I stopped at the town of Judsonia. 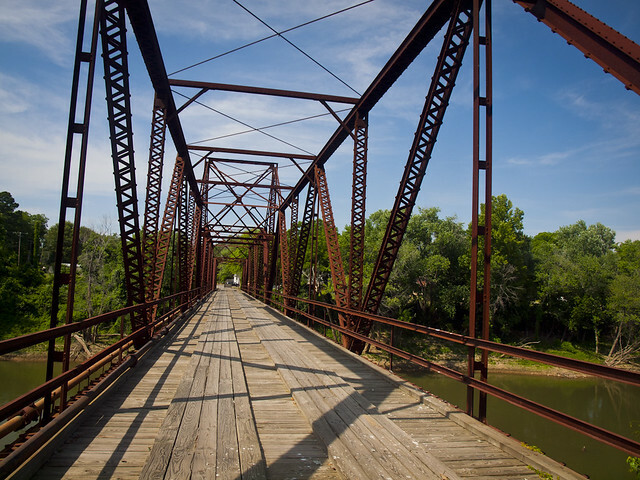 Judsonia is a small town (population 1,982) that has a really interesting old bridge. 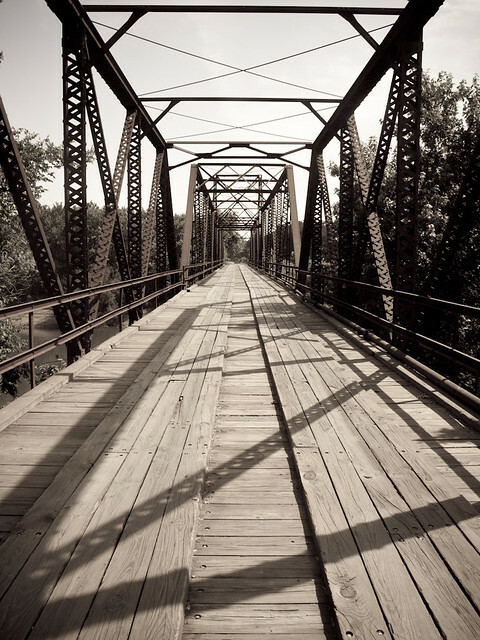 The bridge was built in 1924, and crosses the Little Red River. I first saw the bridge while rushing through Judsonia many years ago - a friend I worked with was getting married there. I had severely misjudged the time needed to drive from Little Rock to Judsonia, so I arrived at the wedding very late. I tried to stealthily sneak into the back of the church near the end of the wedding, hoping that no one saw me. So I eagerly drove to the bridge, looking forward to getting a newer shot. But, sadly, it turns out that time has taken it's toll on the bridge. The cool old water tower, which was perfectly placed for pictures, is gone. And the old bridge is closed, with gates at each end. Apparently the bridge has been classified as "structurally deficient" after the Highway Department found a cracked crossbeam. 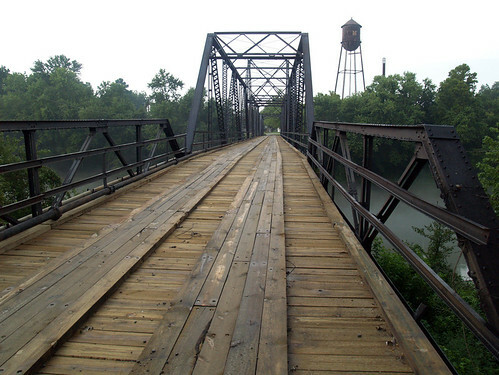 Until the county finds $509,000 for repairs, the bridge is closed. But luckily, not closed to people! I went through the gate and walked across the bridge. I took a few pictures in the hot 95 degree weather. There is another old bridge, just upriver from here. It's older (built in 1912) and actually still in use by the Union Pacific Railroad. 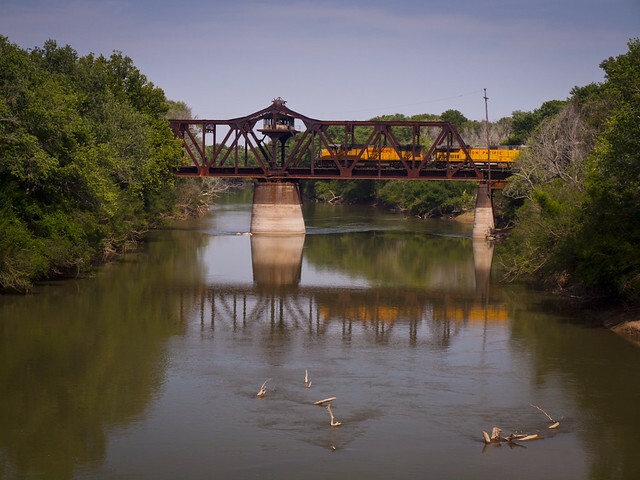 When I was out there, I heard the distant sound of a train whistle, and waited a few minutes for the train to cross the bridge. Since traffic has stopped using the bridge, it looks like nature is slowly trying to reclaim it. 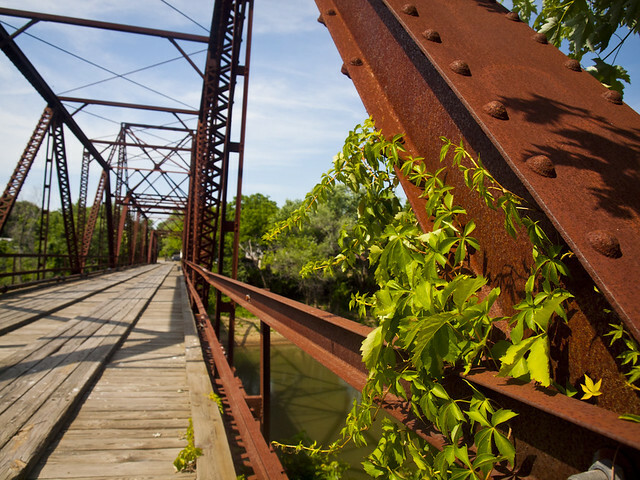 On both sides of the bridge, vines and plants were slowly trying to colonize the old steel. But one good thing about the bridge being closed, is that you can now take a lot of pictures there without worrying about any traffic coming by. The bridge is only wide enough for one lane of cars, so if you were on the bridge when a car comes by, you'd have to escape to the other side quickly like one of the kids from Stand By Me. I really hope that the money is found to at least preserve the bridge and keep it open. 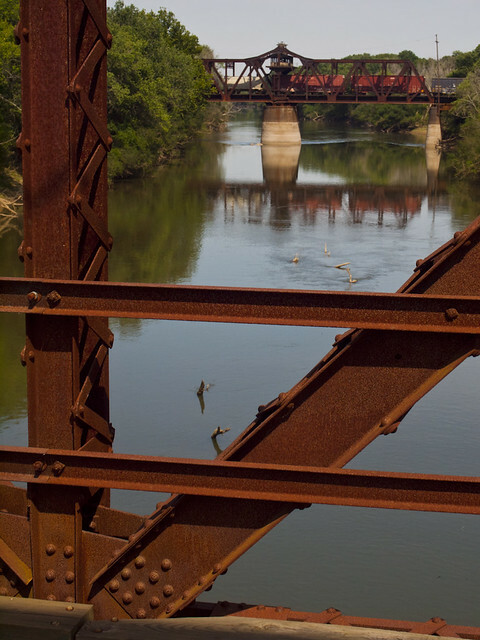 We've lost too many of the old bridges like this in Arkansas. They definitely don't make them like this anymore. 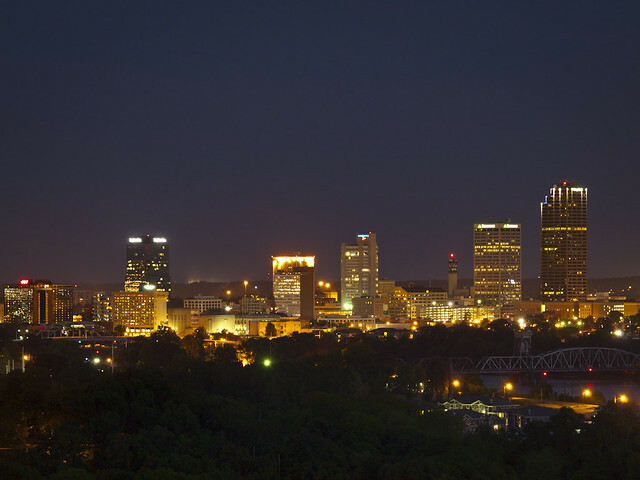 On Sunday night I headed to downtown Little Rock with the idea of getting a picture of something. I drove around a bit and finally decided to try to get a shot of the old Federal Courthouse on Second Street. I've managed to get a few pictures of it during the day, but never at night. It's a neat old building, constructed back in 1881. 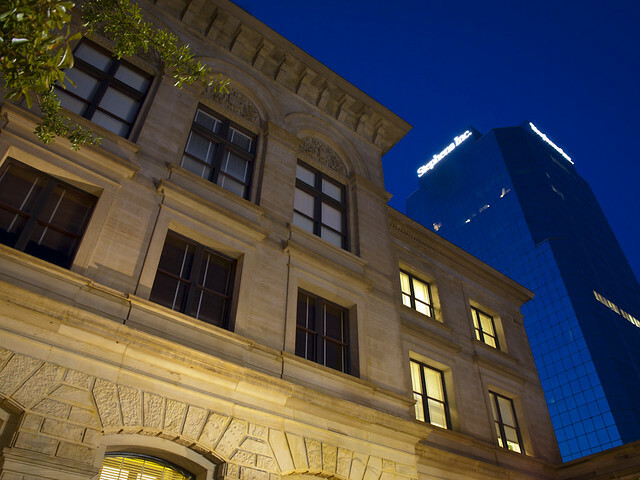 It was originally built to be a post office, then it became a federal courthouse and office building. Now it's the home of the Bankruptcy Court. Towering above it is the Stephens Building (built in 1985), which provides a nice contrast of architectural styles. I walked a block west to another old courthouse - the Pulaski County Courthouse. This is probably one of my favorite buildings downtown. It was built back in 1889, which is pretty old. To put it in context, this was just a few years after electric service was introduced to Little Rock (1886). It was also around the time that the first streets were paved (with cobblestones) in 1887. It's also a pretty cool looking building too, and one that I like to photograph when I'm downtown. This is what it looked like back in 1905. The county has kindly illuminated the building at night. But the lights on it are funky, some of them being a few different colors. I tried to wrangle the colors in photoshop to make them look right, but had little success. 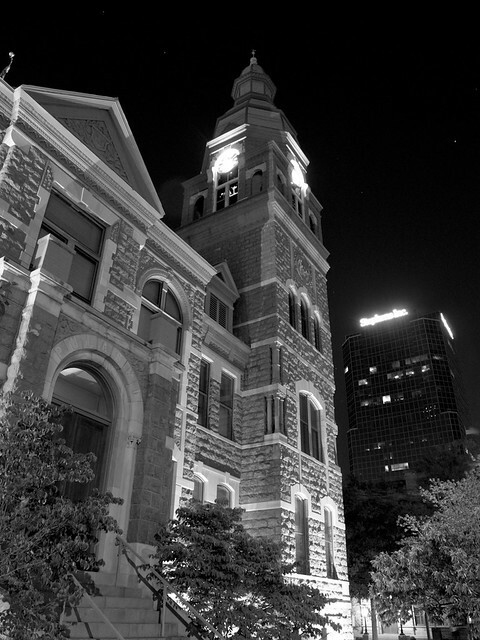 So I gave up and just converted it to black and white, which still shows how cool the building is. And one funny quirk about the courthouse is the clock in the tower. The clock was refurbished during renovations, and efforts were made to keep everything historically accurate. But when the clock was originally installed, there was a little mistake on it. Turns out that whoever built the clock wasn't up to date on their roman numerals, so they messed one of them up. They put in "IIII" instead of "IV" for 4:00. When the building was renovated, the historic mistake was kept and is still there to see today. My alarm clock went off painfully early last Saturday morning, rudely awakening me. So I hit the snooze button a few times. I eventually got up, and surveyed my campsite at Richland Creek. I cleared camp pretty quickly, which was easy because I cheated and slept in my car. A few minutes later, I was back in the car and driving off to visit a few nearby waterfalls before the sun came up. 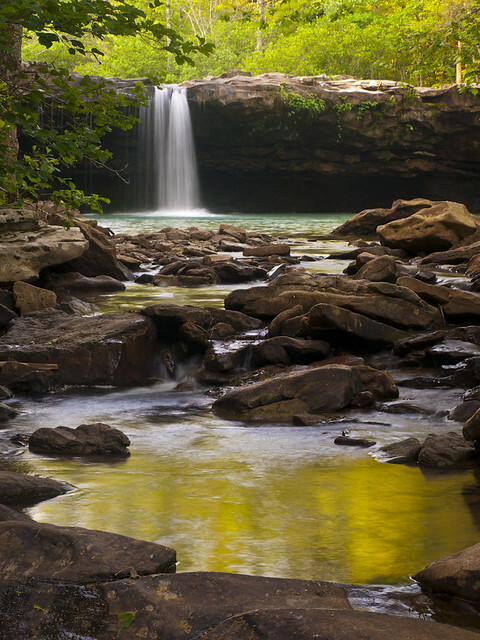 The first stop was Six Finger Falls, on Falling Water Creek. The water level was very low, so that only about two of the six fingers actually had water in them. I stopped to take a few pictures, but none of them really turned out. I got back in the car and headed to Falling Water Falls. This is a neat waterfall - it's scenic and very easy to get too (it's right off of the side of the road). The water level was very low here too, but I stopped for a bit and took a few pictures. I wanted to go camping last weekend, in order to enjoy the outdoors before the heat and humidity of summer settles in. 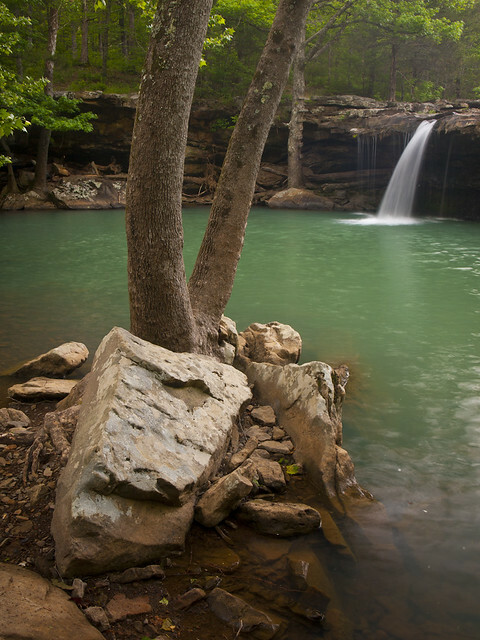 Luckily, work kindly agreed to let me leave a bit early on Friday, and I immediately headed north into the Ozark Mountains. 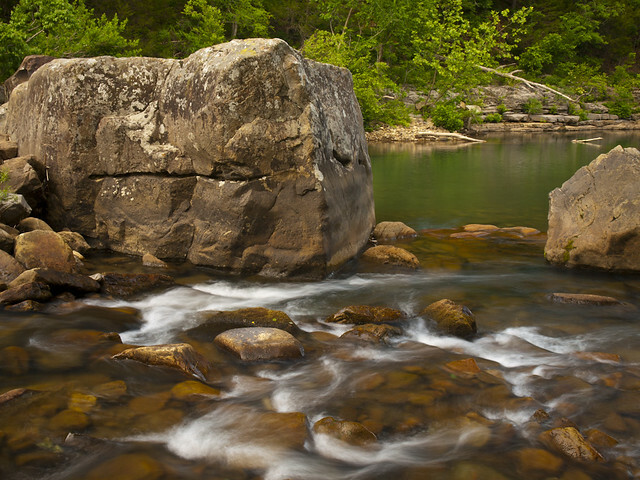 My destination was Richland Creek, which is perhaps one of the most scenic streams in all of the Ozarks. 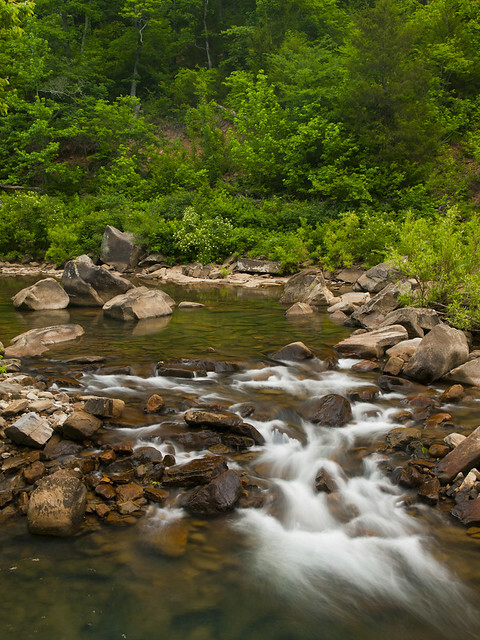 The stream, and its rugged beauty, are largely unspoiled. And it's just enough away from the beaten track that few people even know about it. It's a fairly large stream, and I hoped that there would still be some decent water in it, even with the distinct lack of recent rainfall. I passed by the area of the landslide, and it's easy to see why it took the Forest Service so long to clear it. They pretty much took out every tree along the steep hillside above the road. It's now a grassy slope that angles down towards the road. It definitely sticks out from the rest of the drive, which is surrounded by thick forests. But as long as it keeps the road open, I guess I'm ok with it. And pretty soon I reached the campground and claimed a spot. It was still about an hour or so before dark, so I hurried to gather some firewood for the night. I claimed some sticks and fallen tree limbs from the beds of poison ivy they were resting in, and then grabbed the camera gear and headed to the creek. I was standing on the top of a large rock taking pictures, when I noticed the light behind be starting to change. The hillside, in the distance downstream, began to be hit from the golden light of the setting sun. I hurried to move the camera and get a few shots. In the span of a few minutes, the light faded away. As I was slowly making my commute home from work last night, I noticed some interesting clouds up in the sky. If they managed to stick around a few hours, they might lead to an interesting sunset. So as it got closer to dusk, I grabbed the camera and tried to find a spot for a few pictures. I ended up at Fort Roots, on the Big Rock across the river from Little Rock. 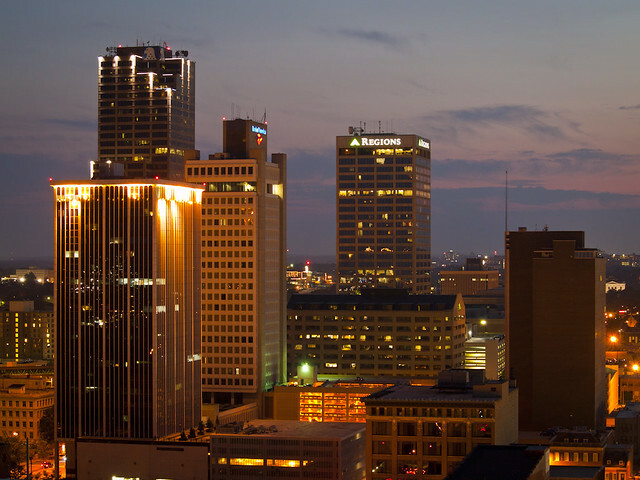 The view of the downtown skyline from there is terrific. In the past, it hasn't always been easy. Fort Roots is part of the VA Medical Center, and security guards would chase off people with cameras. But luckily, a new bike/walking trail has been built that runs along the bluff, just outside of the fence to Fort Roots. So I was able to stand up there taking pictures without any visits from security. Instead, it was a guy walking his dog, someone else taking pictures, and a bunch of people whizzing by on bikes.